10.9.2002 :: Good Lord! CanaryNoir was a USAToday Hot Site and I didn't even know it! Arune Site of the Month for March 2001! 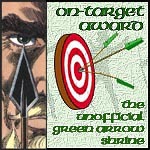 Birdwatching has been honored with the On-Target Award, conferred by The Unofficial Green Arrow Shrine! Birdwatching thanks site proprietor Jayme Lynn Blaschke and encourages you all to visit his terrific site. In other news, Birdwatching & CanaryNoir showed up all over the place in print in 2000! Wow! We were very honored to be mentioned in the debut of the Wizard Magazine column Dot.Comics (#106, p. 35) and were even MORE honored to be mentioned by the "Father of the Birds of Prey" himself, Jordan Gorfinkle, in the letter column of BoP #20. We also got a little plug in a Pipeline review of Chuck Dixon's work on Nightwing and Birds of Prey on that excellent comic magazine website, ComicBookResources.com. The truly wonderful DC fanzine website, Fanzing awarded Birdwatching their Best of Fandom Award for March 1999. The Stephie Award for Web Excellence for January 1999, awarded by Sean Taylor, proprietor of the terrific DCU: The Next Generation website. The January 1999 Helmet of Honour Award presented by Tim Holtorf, proprietor of the Hawkworld Webring and many fine, Hawkman-related websites. The Emerald Boxing Glove Arrow awarded by Scott McCullar, proprietor of the incredibly thorough and all-around excellent site, the Unofficial Green Arrow Compendium. Thank you very much to everyone who has recognized this site. We'll try to live up to the honors.